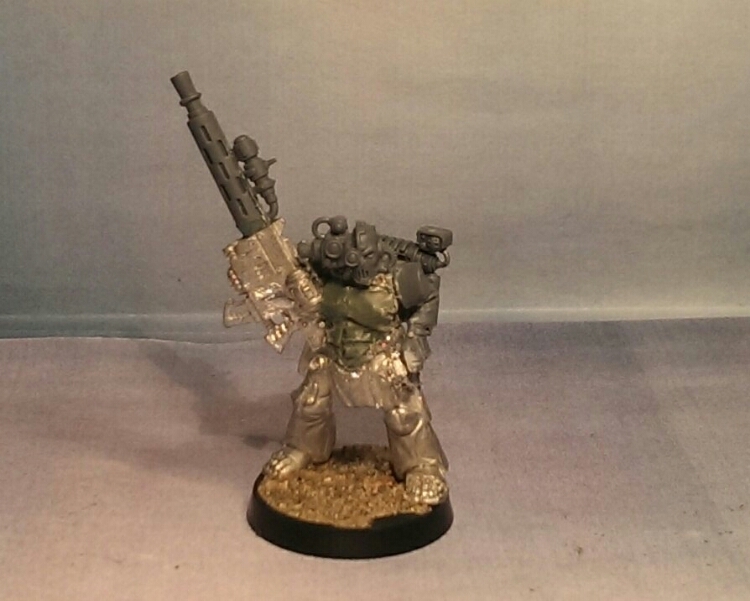 Wielding a modified heavy stubber the Huskarl stand ready to protect his master from harm..
Great looking Tech-Guard! Using Tycho as a base for the model was a wonderful idea. The head-swap is perfect! The only thing I would look into modifying is his rifle. The barrel looks to be slightly crooked. I would try and modify its position to get it as straight as possible. Cheers Adam 🙂 it was more difficult working with Tycho than I thought due to all of the BA ornaments on that miniature. But I think I managed to pull off a completely different aesthetic and something that suits the rest. I thought the barrel was straight, I need to check up on that asap. You did a great job distancing the model from looking like a Blood Angel (particularly since you used the metal version, GW metal being very hard and tricky to work with). To me the barrel looks like it is tilted upwards a little. It is not too bad, but since the barrel is so long it looks really apparent to me. Cheers 🙂 Definitely difficult as I’ve busted several of my tools on these. Still worth it though! Well I’m definitely taking a closer look that’s for sure. This guy reminds me of a Vindicare. Nice job! Yeah he actually does come to think of it 🙂 Wasn’t in my mind when I was working on him.